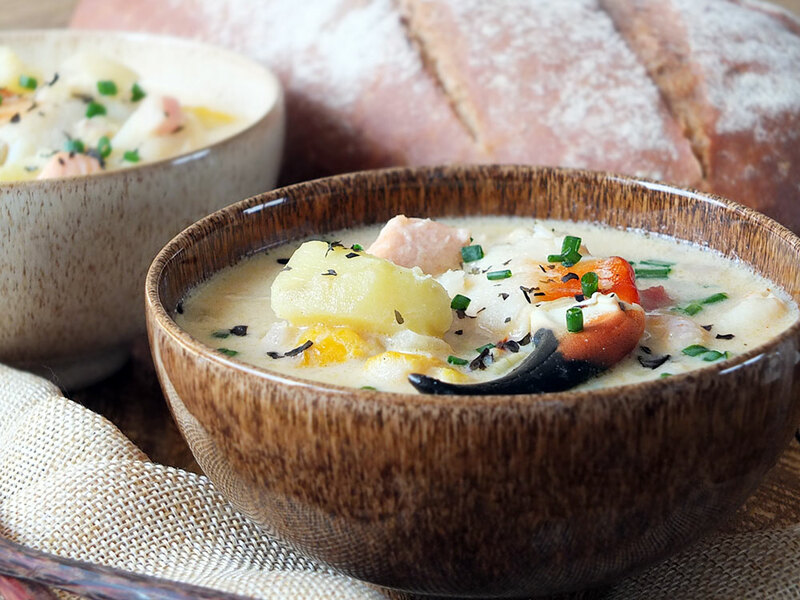 This easy to make seafood chowder can be on the table in under 40 minutes. This recipe is in collaboration with Discover Delicious: the new way for discerning food & drink lovers to hunt out the homegrown heroes and prime producers in Wales. 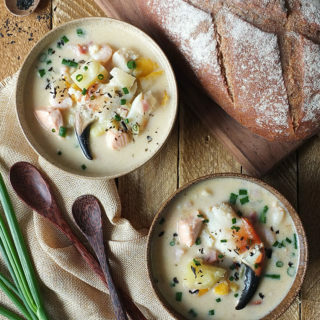 Let me take you on a culinary journey to Wales through a steaming hot bowl of creamy seafood chowder. Food, eh? It’s a global conversation we can all have, no matter what language we speak. When we think of the word cuisine, we usually think of Italian, Mexican or French. British cuisine usually not in the forefront of our thoughts when it comes to food, but the United Kingdom produces a diverse wealth of food and drink, with each of the four kingdoms being renowned for at least one dish. Go on, I bet you could name one for each country now. When it comes to Wales, what do you usually associate with them, food-wise? For me it’s cider, and laver, a seaweed I’d only heard about through the food blogging scene but never, until now, had the chance to try. Then there’s lamb, of course, and Welsh cakes. “Don’t forget Welsh rarebit!” my husband reminded me as he proof-read this post prior to publishing. This is where Discover Delicious comes in handy. 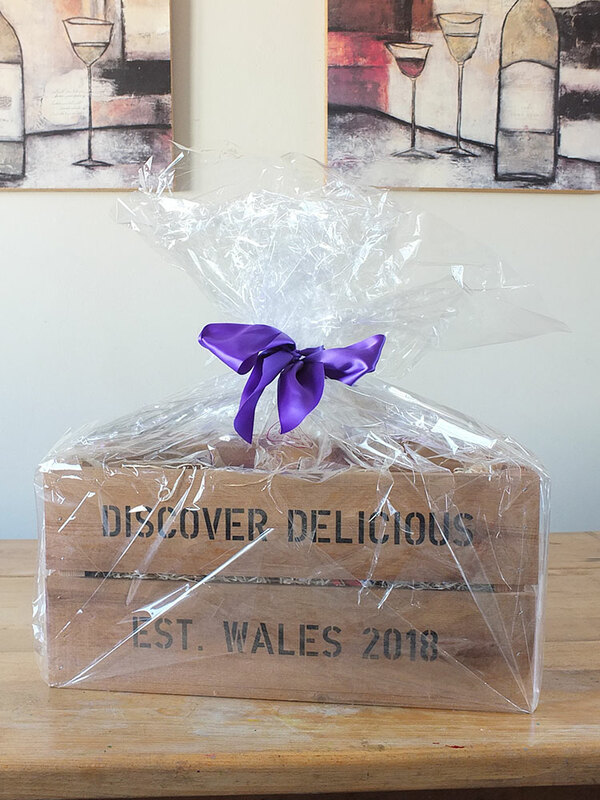 Founded in 2018 by Laura Pickup, Discover Delicious is a one-stop online shop created to showcase the wealth of food and drink available from Welsh producers. 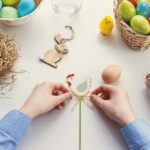 “Journey with us and be inspired by authentic, local and sustainable delights that are reared, grown or crafted in Wales. Meet the farmers, fruit growers, fishermen and many more besides observing old practices and breaking new ground in their passionate pursuit of the palatable. 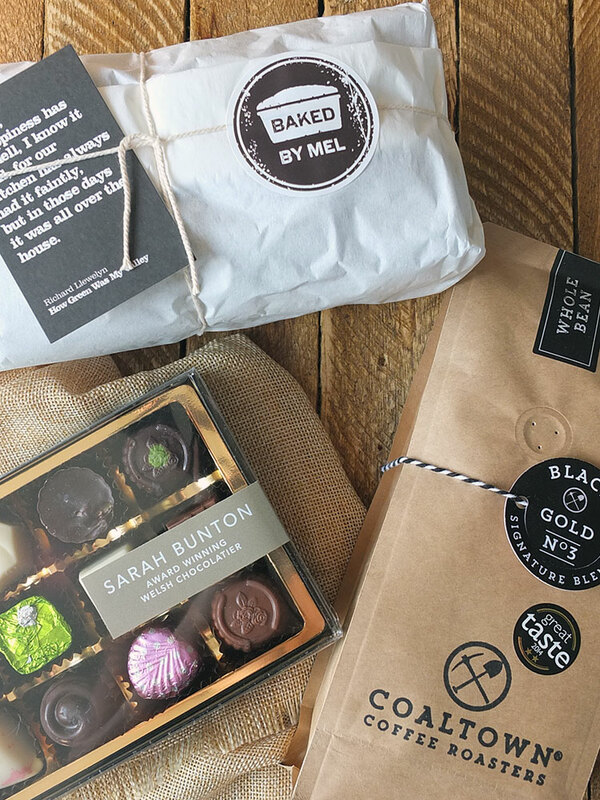 From cheese makers to chocolatiers, butchers to microbreweries, Discover Delicious aim to gather together hundreds of local products in a celebration of the way good food should be. 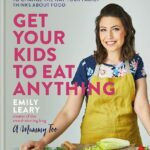 Discover Delicious invited me to participate in their ‘Discover Wales With Me’ challenge, inviting me to create a three-course meal showcasing products found on their website. I spent some time browsing the wide variety of foodstuffs available, but given that I live in the remote Shetland Islands (the other end of the country) with a longer delivery time, I had to select non-perishable store-cupboard items. If I was on the mainland, this recipe would definitely have featured some of the gorgeous beef and lamb available from Wales. Nonetheless, as soon as I spied a special seafood spice rub in a gorgeous little tin I knew I wanted seafood to be the star of the show and my entire meal was subsequently based on that. My selected products arrived via courier packaged in the most fantastic wooden crate. It was wrapped in cellophane and tied with a gorgeous purple bow. Unpacking the contents of the crate felt a little bit like Christmas morning. The crate contained cocktail biscuits, Belgian chocolate, a tea loaf, coffee, the seafood spice blend, sea salt and pepper, bottles of dried seaweed and eight bottles of cider. 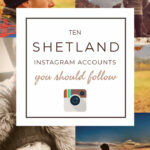 Using these storecupboard items and fresh Shetland seafood, I created my three-course meal. 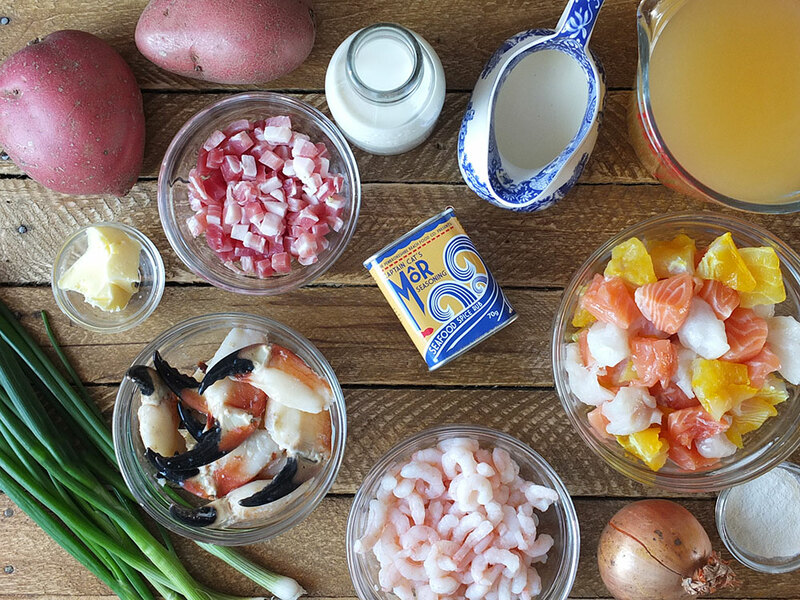 fish pie mix – a blend of salmon, white fish and smoked fish. Step 1: Heat butter in a large soup pan and saute the onions and pancetta until softened and cooked through. Step 2: Add the potatoes and fish stock, cover and simmer until the potatoes are cooked. Step 3: Coarsely mash some of the cooked potatoes to help thicken the broth. Step 4: Add the milk and the fish pieces and simmer until cooked. Step 5: Add the cream, seasoning and shellfish. Heat through. Step 6: Stir in the spring onions, and serve with crusty bread. This really is a remarkably simple recipe to make. It’s the fresh ingredients and the unique seasoning blend that really make it something special. Serve with plenty of crusty bread for a hearty, satisfying meal. 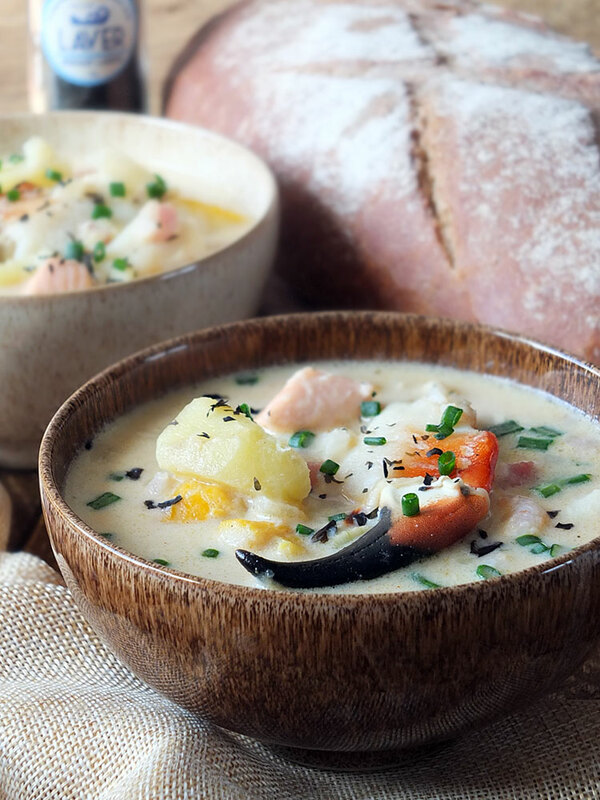 The star of this seafood chowder is a delicious seafood spice blend from the Pembrokeshire Beach Food Co. Captain Cat’s Môr Seasoning is a blend of warm spices, seaweed and citrus, making it an ideal seasoning for seafood dishes like this seafood chowder recipe. Captain Cat is a fictional character in the 1954 BBC radio drama Under Milk Wood by Welsh poet Dylan Thomas. He is an old blind sea captain who dreams of his deceased shipmates and lost lover Rosie Probert. When it comes to this gorgeous little tin packed full of flavour, think salt encrusted decks, citrus flavours from distant shores and dark laver black stormy seas. 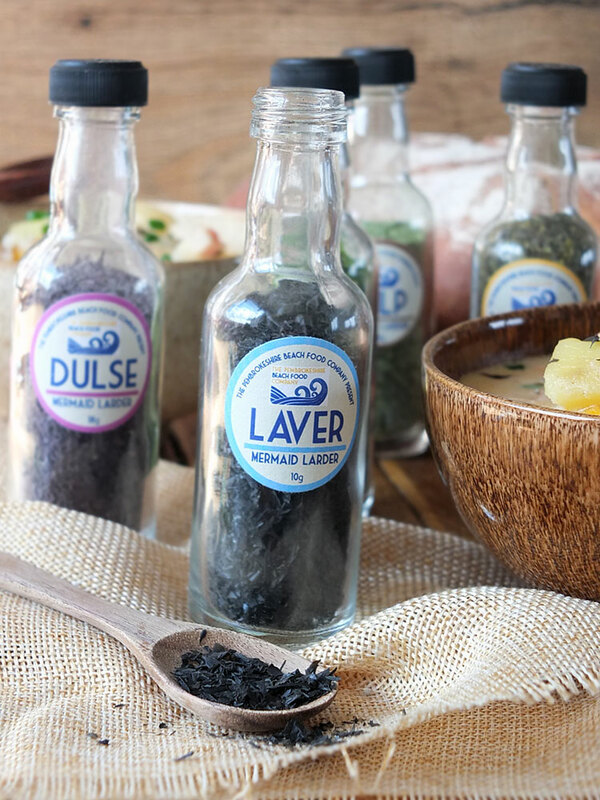 It’s a spice blend for all sea lovers, handcrafted by lovely Welsh mermaids. ‘Môr’ means ‘sea’ in Welsh and a little tin of this seasoning costs just £3.75. 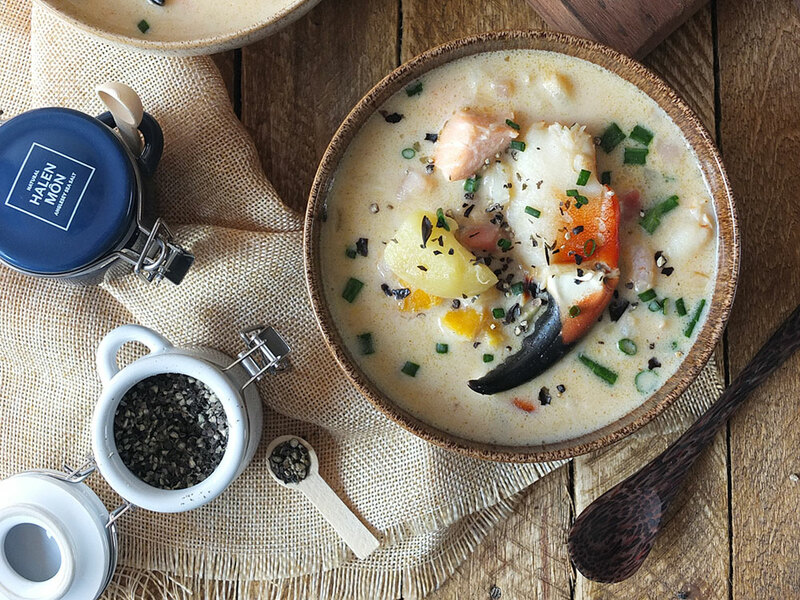 Although Captain Cat’s Môr Seasoning contains enough salt and pepper for this seafood chowder, some palates may prefer an extra dose of flavour served at the table. Halen Môn sea salt is sourced from the exceptionally clean waters surrounding the island of Anglesey. They’ve come a long way since the first batch was born atop their Aga in 1997, and Halen Môn is now sold and served in some of the most famous restaurants and food emporiums around the world. In this duo of little branded ceramic jars with tiny wooden scoops, you’ll find one filled with their award-winning flakes, and the other with specially selected cracked black peppercorns sourced from Vietnam. These retail for £13.65. Longtime readers of my blog will know I am fond of using dried seaweed in my recipes, so you can understand why I was so excited to discover The Mermaid’s Larder – a set of five miniature bottles of dried wild and hand harvested seaweeds from the Pembrokeshire Beach Food Co.
For the final touch on my seafood chowder, I sprinkled a little-dried laver, an edible seaweed used to make Welsh laverbread. The set (and I love the little glass bottles!) also contains gutweed, dulse, kelp and wrack – a perfect introduction to cooking with seaweed. This set retails for £17.50. 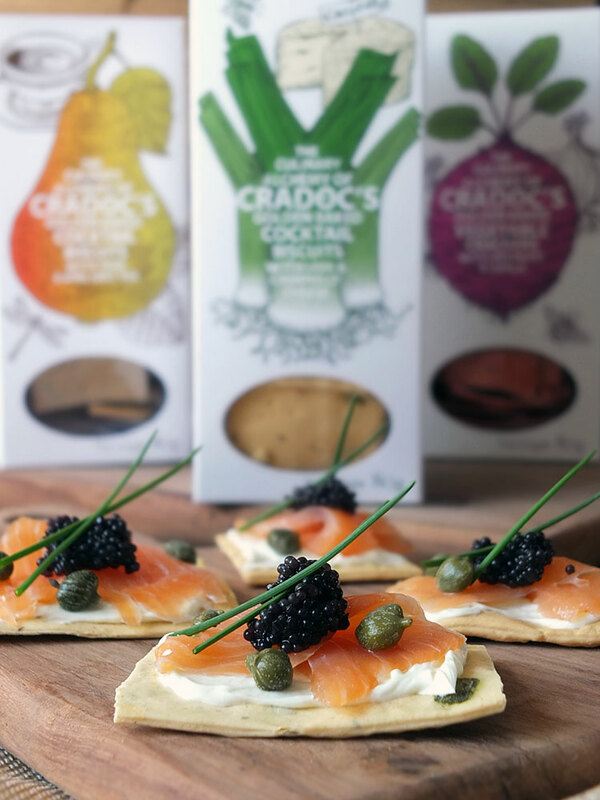 For my starter, I used the Leek & Caerphilly crackers from Cradoc’s as a base for a canapé, spreading them with a thin layer of cream cheese before topping with smoked salmon and a dollop of caviar. A few capers and chives garnish. These cocktail crackers are incredibly moreish and are available in five different flavours: leek & Caerphilly (a hard, crumbly white cheese from Wales), beetroot & garlic; chilli ginger & garlic; pear & Earl Grey and spinach & celery seed. These crackers are perfect for snacking on, as is, or eaten with cheese and chutney. Get a mixed case of three for £12.50. For dessert, a selection of chocolates from Sarah Bunton. 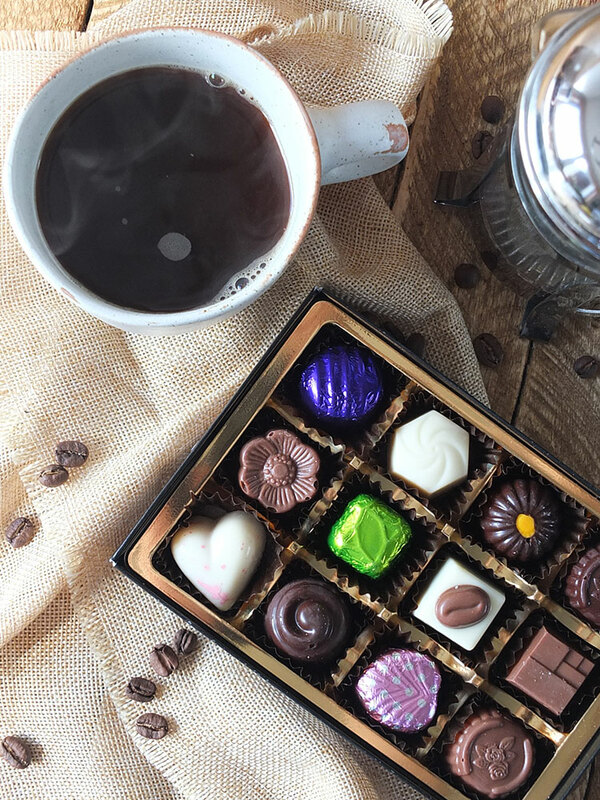 Sarah is an artisan chocolatier based in the idyllic village of Devil’s Bridge in the Cambrian Mountains of Mid-Wales, and her luxury handmade chocolate selection is a beautifully presented box of 12 delicious chocolates, sampling some of their finest flavours. These include strawberry & champagne; Merlyn the Wizzard (Merlyn creme liqueur) and Cambrian mountains honey, all encased in quality Belgian chocolate. Each morsel is an exquisite taste sensation; perfect for an after-dinner indulgence. A 12 chocolate box costs £10.75. To accompany, a mug of Black Gold No3, the signature espresso blend from the Coaltown®Coffee Roasters. Based in the town of Ammanford in South Wales, a small mining town that was once famous for its anthracite coal (aka ‘black gold’). Sadly, the last mine closed down in 2003, but the team behind the Coaltown® Coffee Roaster are trying to bring back the town spirit behind the black gold in the form of coffee. This delicious blend of Brazilian, Colombian and El Salvadorian Arabica coffee won two gold stars in the UK Great Taste Awards in 2014. This signature blend is hand roasted to just beyond the first crack to give it a rich espresso zing whilst still retaining the natural flavours that are manifested at the origin. Its rich chocolate and biscuit base makes it very drinkable. A 227-gram bag of whole bean coffee costs £7.50. 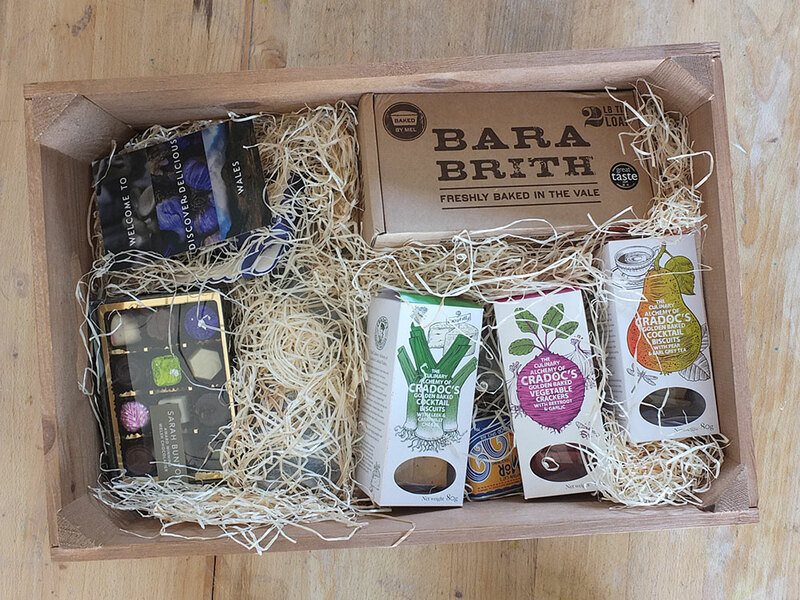 Bara Brith (which translates as ‘speckled bread’ is a traditional Welsh yeast bread traditionally flavoured with tea, dried fruits and mixed spices. It is served sliced and buttered at tea time. This recipe, baked by Mel to their award-winning recipe in a 2lb tin loaf, makes for a rather fabulous supper – you know after you’ve been sitting around the kitchen table for hours chatting after dinner, sipping cider. The tea loaf is packaged in a beautifully designed, sturdy, printed box which opens to reveal a paper-wrapped loaf hand tied with string. If this is being given as a gift they will even include a personalised message. 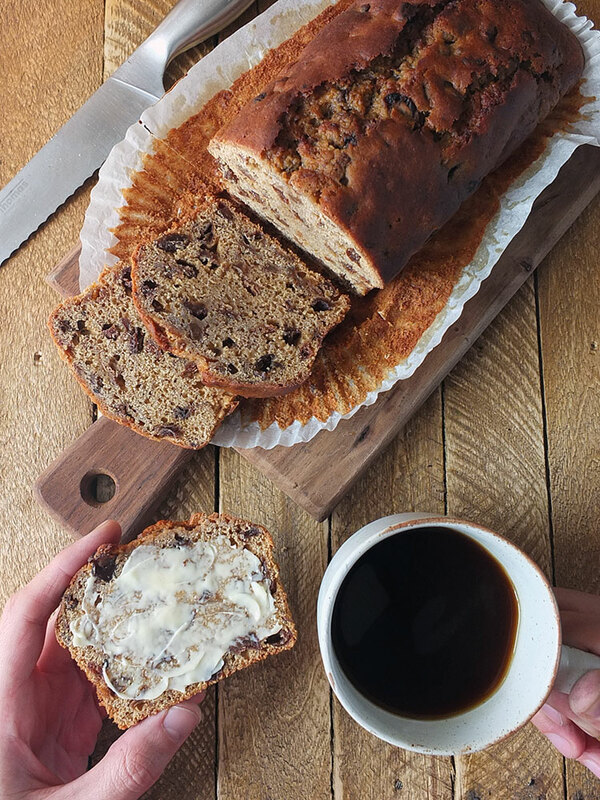 This award-winning traditional Welsh tea loaf lovingly baked at home in small batches costs £15.99. Last but not least, we’ve washed everything down with a bottle (or two!) of traditional real Welsh cider from Hallets. This medium, slightly sparkling cider has won many awards including the BBC Best Drinks Producer 2016. It is blended with vintage cider in small batches to produce a drink with complex flavours. 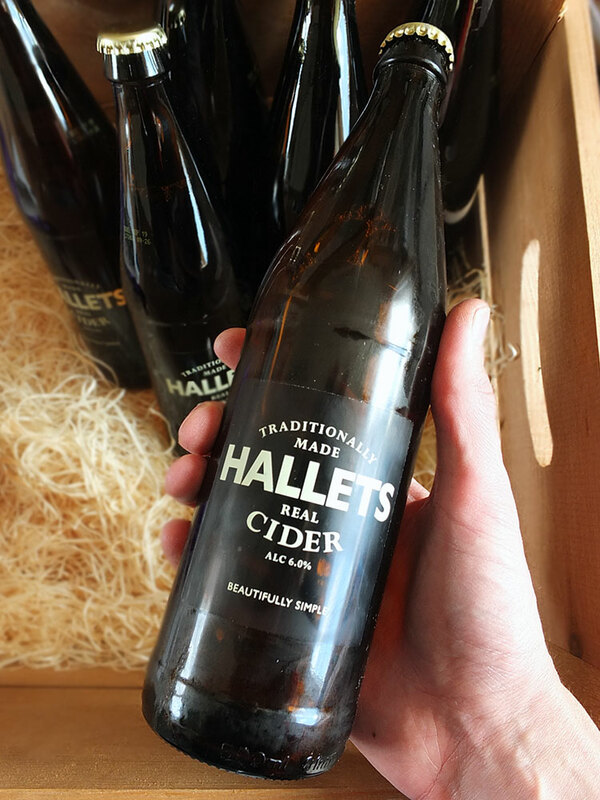 Situated 1000ft above sea level, the apples that make their cider offer a complex and subtle taste, with a crystal clearness akin to that of a fine white wine. It’s all additive free, pure apples and utter deliciousness. A 12 x 500ml case costs £36. 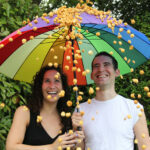 Discover Delicious are acting as flag bearers, showcasing the wonderful produce available in Wales. 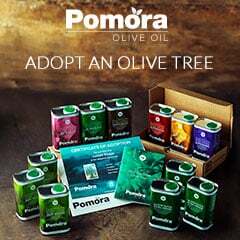 When you order through them your products will be shipped out directly from the food producers themselves, so shipping costs will vary. This also means that if you order several items it is likely they will be sent in separate shipments. “We’re here to connect food, drink and flavour lovers with the hidden gems on offer from all corners of the country. Taking the hard work out of finding new tastes, treats and treasures. You can browse a wide variety of Welsh food & drink on the Discover Delicious website. Follow them on Facebook, Twitter and Instagram and don’t forget to subscribe to their to be kept up to date on what’s happening with the food and drink scene in Wales! Have you ever visited Wales? 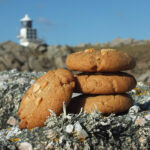 Do you have a favourite food memory from the area? What Welsh food producer or recipe would you recommend we absolutely must try? Let us know in the comments! 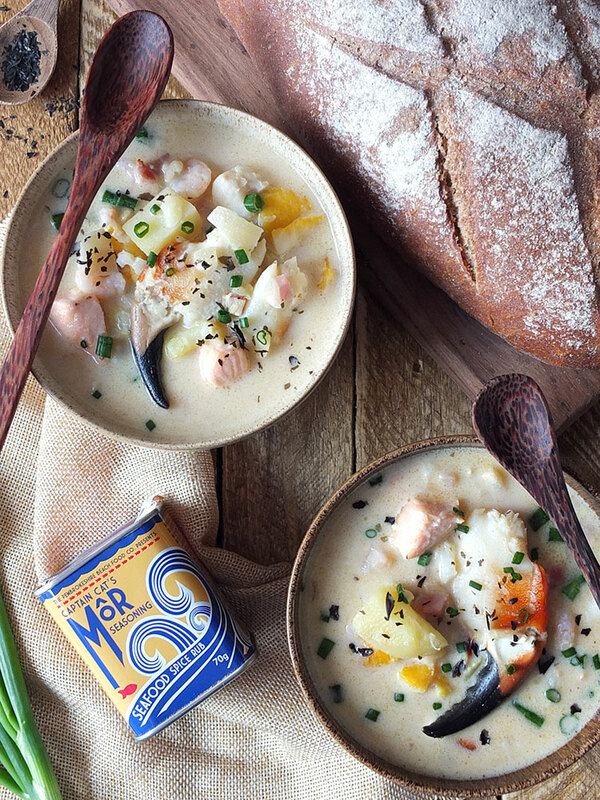 A simple-to-make but very delicious and creamy seafood chowder made with Captain Cat's Môr Seasoning from Wales.Serve with crusty bread for a hearty meal. Heat butter in a large soup pot over a medium heat. Saute the onion and pancetta for 5-10 minutes until they soften and the pancetta is cooked. Add the flour and cook for a futher minute, stirring constantly. Add the diced potatoes and the fish stock. Bring the mixture to a gentle simmer, pop the lid on and simmer for 10-15 minutes until the potatoes are cooked. Mash some of the potatoes in the soup pot with a potato masher to help thicken the broth, and add the milk and Captain Cat's Môr Seasoning. Add the cubed fish pie mix and simmer for five minutes. Add the cream, the cooked prawns and the craw claws and simmer for another 2-3 minutes, until the shellfish is heated through. Stir in the spring onion and divide between four serving bowls. Garnish with more spring onion and a sprinkling of laver seaweed, if using. Serve with crusty bread. This is a sponsored recipe post in collaboration with Discover Delicious. Thank you for supporting the brands who make it possible for me to do what I love: mess up my kitchen and share recipe stories. Oh my God! 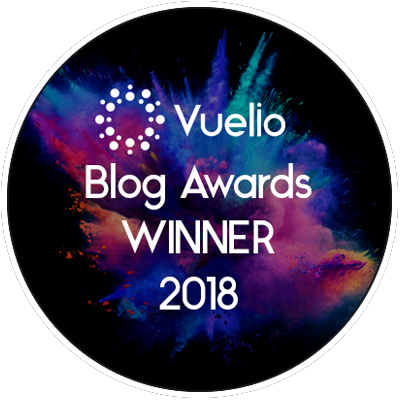 I love reading blogs like this one. You can learn how to make delicious and tasty food. 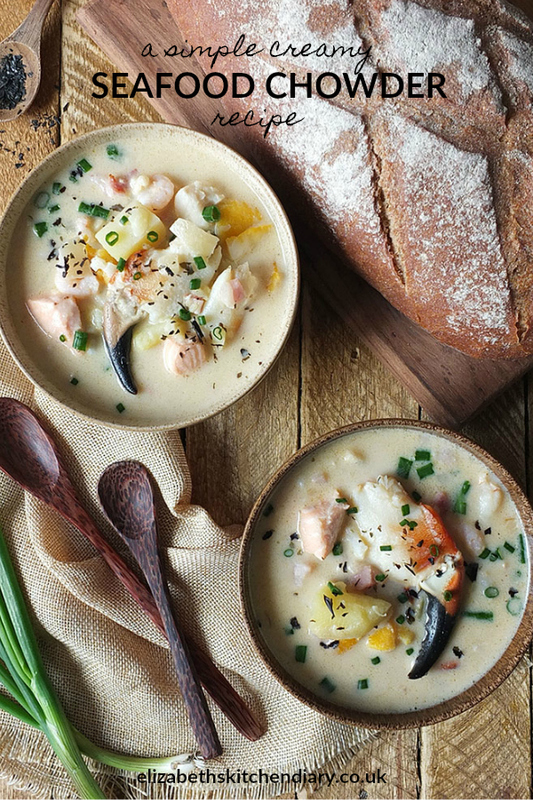 I will definitely try to make this seafood chowder. It looks very yummy. So, I will try it as soon as possible. What is your favorite food and how often do you spend your time in the kitchen? Oh nice! 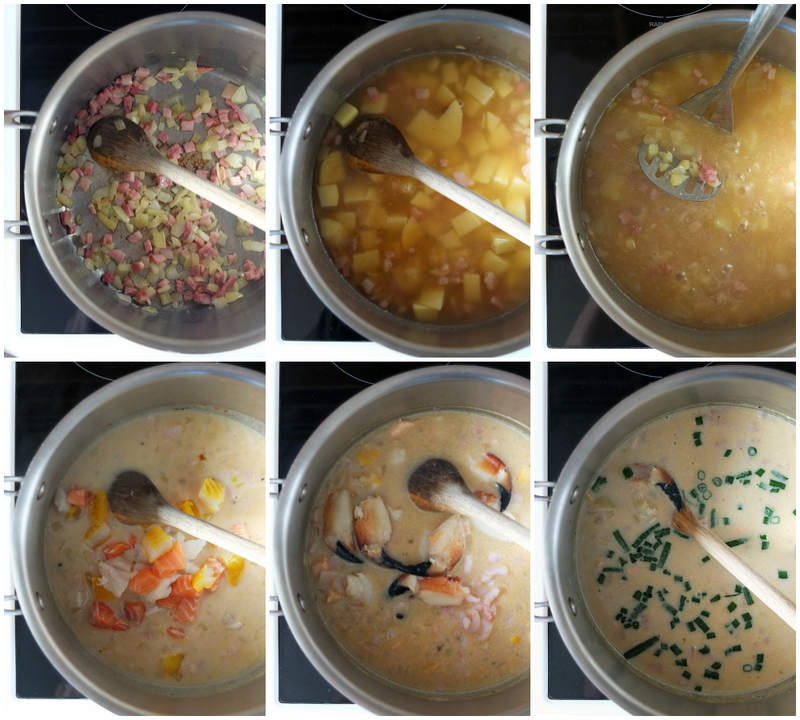 I always said I hated chowder and refused to eat it, then in Scotland earlier this year I was served it with friends and tried it out of politeness….and I LOVED it!! I have been a massive fan of chowder ever since I had it on holiday in America. It never seems to be quite right when done here, but this look so authentic. I look forward to giving this a go as it really is such a favourite dish of mine. Thank you for sharing it! I’ve been looking for a good chowder recipe. This recipe looks so delicious! I can’t wait to try this! Such an incredible box of items, I am loving this chowder, to looks so delicious and ever so yummy. Now this sounds good I have to admit I don’t think I’ve ever tried making anything seafood based quite like this before I need to give it a try. This looks so appetising! I might have to try this. That chowder looks delicious and I will definitely be checking out the Discover Delicious website. 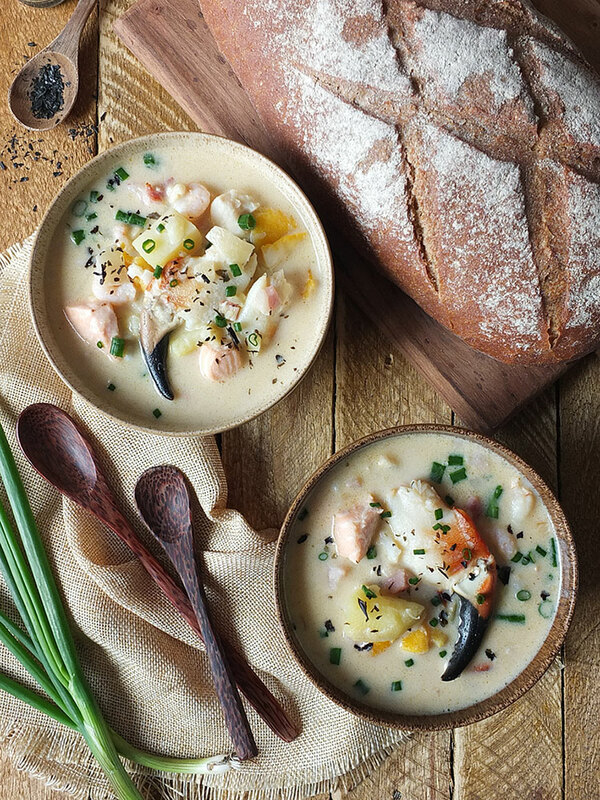 Such a great looking recipe for seafood chowder. Your pictures are beautiful and really make you want to dive right in! What a fun box of surprises and such a mouthwatering chowder! I wonder if that Mor seasoning is anything like Old Bay — that’s what we use on seafood in the Mid-Eastern U.S.
Looks beautiful! Love the seasonings you used. I have never been to Wales but it sounds like my kind of place! 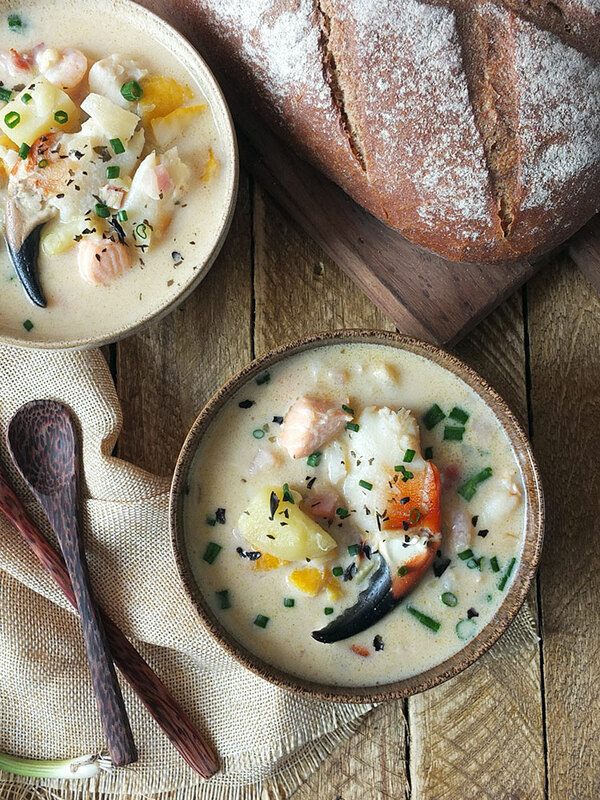 I love seafood chowder and I love that you used stone crab claws. I don’t get to enjoy them often but this chowder may just change that. And on another note – that packaging is beautiful!